Kids need a place where they can have fun and be active, rain or shine, and Kid Fit NJ is the perfect place. Kid Fit NJ’s incredible classes help build physical, social and emotional skills in a non-competitive and play-based environment. Classes are led by qualified, hands-on instructors who tailor each program for specific age groups. In these age-appropriate tumbling classes, children ages 110 develop their major mus cle groups while learning fundamental tumbling skills. Looking for a challenge? 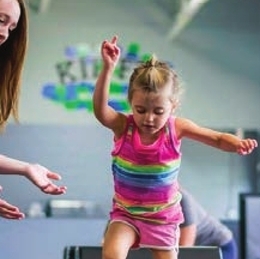 Kid Fit NJ offers Ninja and Superhero classes! The Ninj a class puts kids’ strength, agility and coordination to the test with a customized ninja obstacle course. In the Superhero class, kids u se their imagination and work as a team to solve weekly missions. They will jump, climb and zipline on their way to save the day. Kid Fit N J offers a one-of-a-kind party experience for you and your guests. Party families and guests get exclusive use of the facility and two hours of age-appropriate activities, all coordinated by trained party hosts. Kid Fit NJ staff will handle all setup, ser vice and cleanup, allowing the parents to enjoy the party. Their goal is to make the party experience as stress free as possible! Sometimes, kids just need a chance to run around and get some energy out. The freedom of Open Play offers the flexibility to drop in for individual sessions. Kids can climb, jump and roll in a bright, clean, open-air facility. During this unstructured time, Kid Fit NJ’s staff is there to ensure that every one is playing safely. Open Play is available Monday through Friday with discounts available for Garden State Discovery Museum members. Kid Fit NJ welcomes local scout troops to the facility for team-building events. They offer 90-minute sessions for Boy Scout and Girl Scout troops to participate in obstacle courses, relay races and games to build confidence and a sense of unity. At the end of the event, scouts earn a special Kid Fit NJ badge! Each month, Kid Fit NJ hosts a variety of themed events that range from visits from princesses to dinosaurs! Another popular event is Nerf Night, where kids can participate in an all-out nerf battle, complete with customizable nerf guns, ammo and safety goggles. For upcoming events, check out the K id Fit NJ website, or follow them on Facebook.